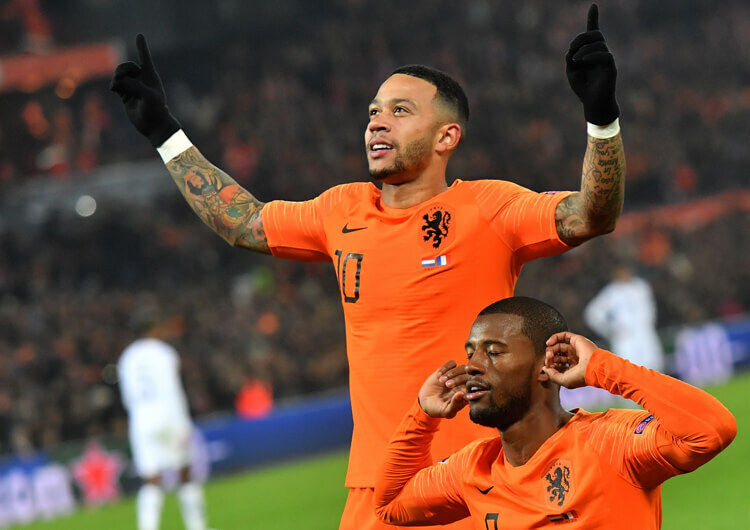 A late Netherlands fightback saw them rescue a draw against Germany in Gelsenkirchen and deny World Cup winners France a place in the semi finals of the inaugural UEFA Nations League. That looked unlikely 20 minutes in, with Joachim Low’s side dominating and two goals to the good through a long-range Timo Werner shot and a deflected Leroy Sane effort. Fresh from a confidence-boosting win over the French just days earlier, the Dutch regrouped and gave themselves hope when Quincy Promes struck an excellent right-footed shot past Manuel Neuer five minutes from time. 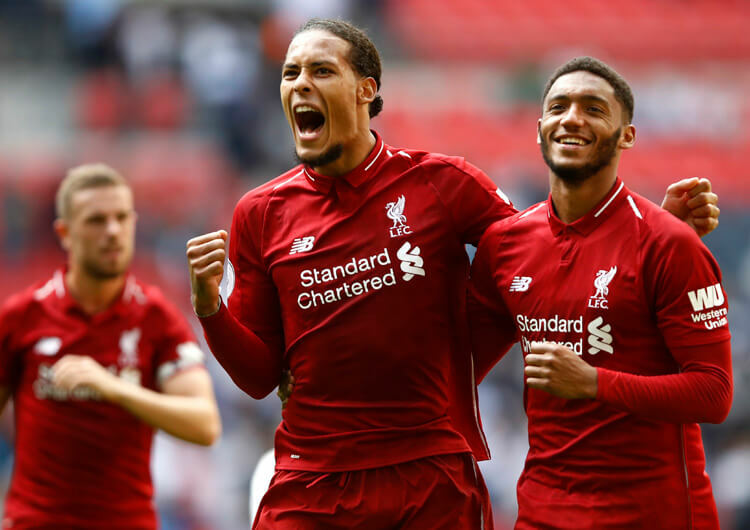 Then, with added time imminent, emergency forward Virgil van Dijk popped up with a stunning volley to earn his team a point – and a place alongside fellow semi-finalists Portugal, England and Switzerland next summer. 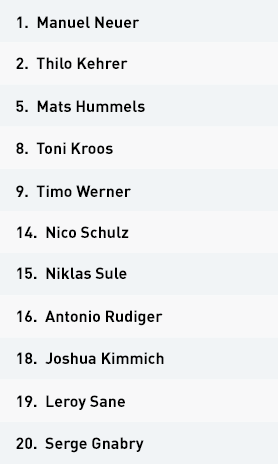 Germany set up in a 3-4-3 in possession, with wing-backs Thilo Kehrer and Nico Schulz moving into the midfield line alongside Toni Kroos and Joshua Kimmich. The attacking trio was comprised of Timo Werner, Leroy Sane and Serge Gnabry. Germany had two primary strategies in attack. The first was to drop Gnabry, who played frequently as a false nine, into an attacking midfield position and play the ball into his feet. Invariably he would bring an opponent with him – this was often Dutch centre-back Matthijs de Ligt, but sometimes he would occupy Marten de Roon or Frenkie de Jong if they weren’t already monitoring Kimmich and Kroos. When the ball was played into Gnabry’s feet, he could either set it to Kroos or Kimmich in front – who would be forward-facing and could play a penetrative pass as the next action – or he could play it around the corner to Werner or Sane. This strategy could be seen for Germany’s opening goal, scored from distance by Werner, and was repeated several times. The second strategy was to look for the runs of Sane and Werner in behind the Dutch defence. If Kroos, Kimmich or any of the Germany back three had good possession with no or limited pressure on the ball, then Sane could be seen looking to run in behind. The high positioning of Schulz on the left meant that Dutch right-back Kenny Tete had to watch him as well as Sane; de Roon would often drop in to help, but Sane was clever and would look to begin his run whenever de Roon was looking at the ball and not him. This was evident for Germany’s second goal. Out of possession, Germany used a 5-2-3 mid-block, with Schulz and Kehrer joining Niklas Sule, Mats Hummels and Antonio Rudiger in the back line. Germany rarely looked to press the Netherlands defenders, and would instead encourage play to go out wide. 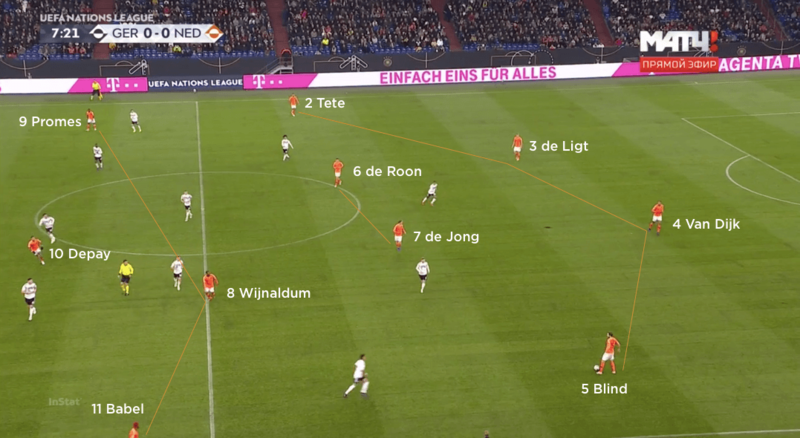 They then used their wing-backs to press Netherlands full-backs Daley Blind and Tete, but as the game progressed and Germany had a lead to defend, they selected their moments to close the ball down. If the ball was in the German half, Sane would close the ball down from a higher position and try to prevent a pass back to the Dutch centre-backs; Kimmich would move towards the ball from a central position and try to prevent play from coming inside; and Kehrer would press from the right to discourage further forward play, while the remaining four defenders in the back five would cover across. 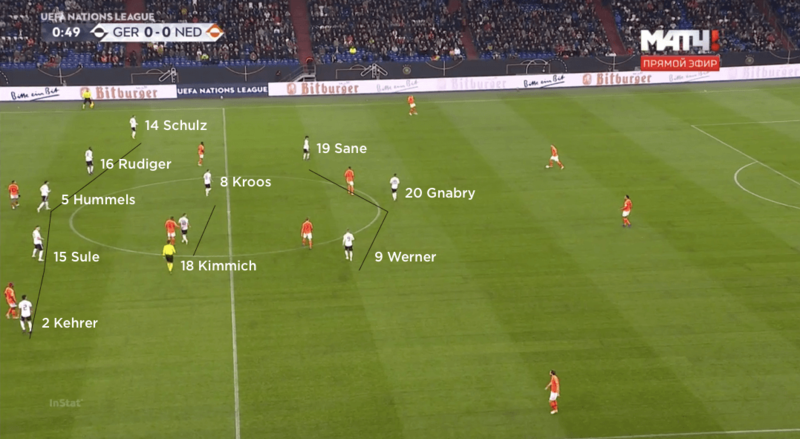 Germany had to deal with being underloaded – two against three – in the middle of the pitch in the second half, so they would use wide attackers Sane and Werner to do a half-and-half job between the Dutch full-back and central midfielder on their side. This opened up the possibility of the Netherlands playing in centrally and then out to the free full-back as the wide attacker moved to close down the midfielder – but this simply meant that the Dutch would have possession wide, which the German defensive structure was set up to deal with. Germany set up in a 3-4-3 formation in possession, with Leroy Sane, Serge Gnabry and Timo Werner leading the line. Out of possession, Germany used a 5-2-3 structure. Wing-backs Thilo Kehrer and Nico Schulz dropped into a back line of five, while the front three would stay narrow and try to force play out wide. Germany would often drop Gnabry into an attacking midfield position, where he would try to link up with his midfielders or play around the corner to his attacking teammates – as he did for Werner’s opening goal. The hosts would also look to play to Sane in behind the Dutch defence whenever possible. Here, a pass to Sane from Toni Kroos led to Germany’s second goal on the night. The Netherlands set up in a 4-2-3-1 formation, with Ryan Babel, Georginio Wijnaldum, Quincy Promes and Memphis Depay as the attacking four. The visitors set up in the same 4-2-3-1 shape out of possession, and would generally utilise a mid-press. In defensive situations, Marten de Roon would drop from midfield to help his back line deal with threatening runs in behind and provide cover out wide. In these instances, the Dutch had more of a back five. Ronald Koeman’s men tried to overload central areas by switching to a 4-3-3 and using Wijnaldum in a deeper role than he started in. In possession, the Netherlands would try to find the dangerous and mobile Depay in behind the German defence where possible. As they chased the game towards the end, Koeman sent centre-back Virgil van Dijk up front to offer an additional aerial threat. The Liverpool defender eventually equalised with a superb volley. 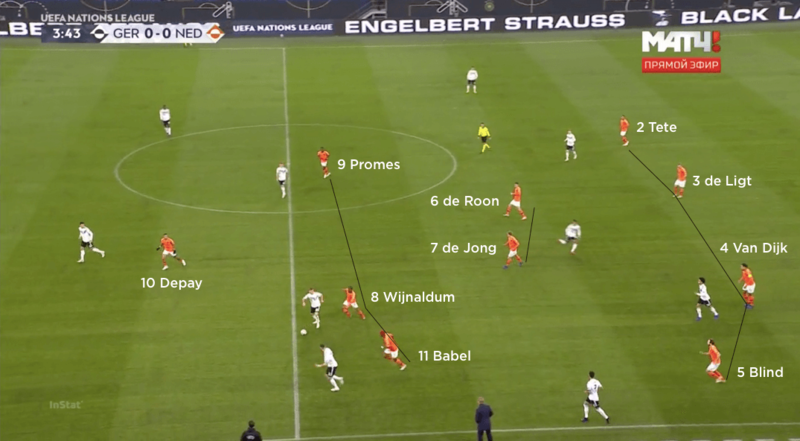 The Netherlands set up in a 4-2-3-1 formation in possession, with Marten de Roon and Frenkie de Jong operating as the two deep central midfielders while Ryan Babel, Georginio Wijnaldum and Quincy Promes supported Memphis Depay in attack. After their excellent display in victory at home to France, the Netherlands struggled to create attacking chances for much of the game, seemingly lacking ideas in the final third. The main strategy was to try to send the ball in behind for the attacking runs of Depay, but the German defence seemed comfortable with dropping and protecting the space. Due to Germany’s structure out of possession, the Netherlands had to try to make use of the wide areas. The ball into either full-back, Daley Blind or Kenny Tete, would be the trigger for rotation between their attacking quartet, with the German wing-backs attracted out to press the ball. Despite their movement, however, they never really managed to break through the German defence in this way. 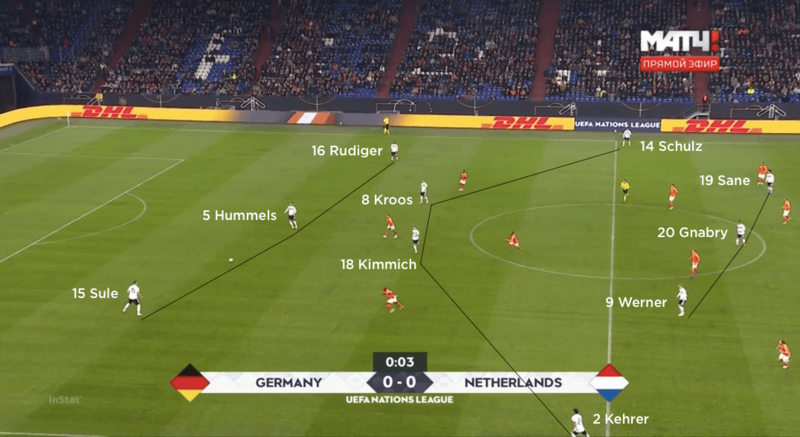 The Dutch switched to a 4-3-3 towards the end of the first half, dropping Wijnaldum (who was later replaced by Tonny Vilhena) into a deeper area and trying to overload the German midfield pair of Kroos and Kimmich. 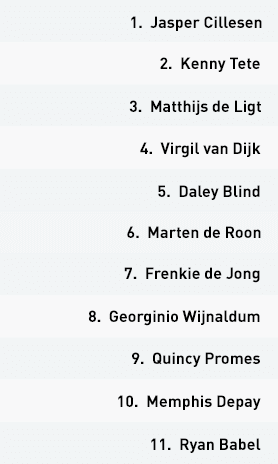 With time running out to save the game and earn a spot in the Nations League semi finals, Ronald Koeman sent Virgil van Dijk up to play as a forward alongside substitute Luuk de Jong. This gave the Netherlands a real aerial threat and another direct route to goal, although a well-organised German defence limited them to crosses from deep areas. The Dutch needed to work better positions from second or third phases of play – and it was from one of these that van Dijk volleyed home a dramatic late equaliser. 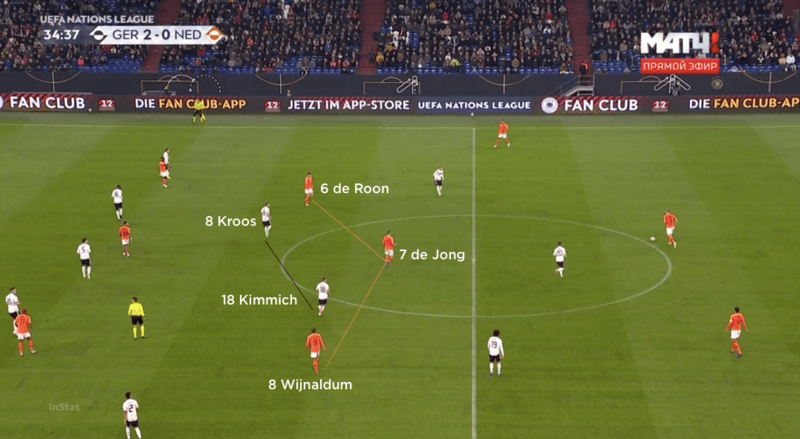 Out of possession, the Netherlands set up in a 4-2-3-1 structure and would operate with a mid-press that looked to show Germany wide. 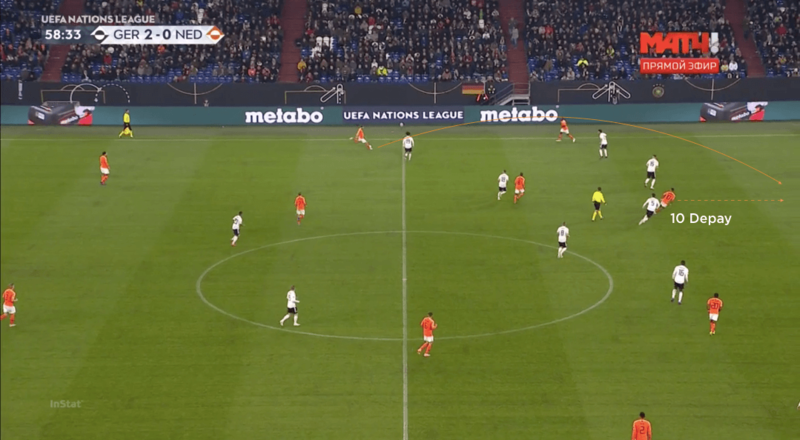 As the ball went out wide, the Netherlands would look to close down with three players – the wide attacker, the nearest central midfielder and the full-back on that side – in an almost identical structure to Germany, although with less cover in the defensive line. The worry for the Netherlands was the potential for numerical inferiority in certain defensive areas due to the height of the German wing-backs, but the role of de Roon was important in attempting to negate this threat. He would drop and almost play as a third central defender to occupy Sane and free right-back Tete up to focus on the offensively positioned Schulz. Sane still proved a handful, as he showed when scoring the Germans’ second, while a dropping de Roon also left de Jong more exposed to Kroos and Kimmich, not to mention the dropping Gnabry, in midfield areas. The fluidity of the German players’ movements caused the Netherlands defence problems throughout – but the visitors kept working and eventually denied their hosts a morale-boosting win after a difficult few months.